SHORT WALK TO FAMOUS SIESTA WHITE SAND BEACH & QUAINT ISLAND VILLAGE. The charm of the Lily patch is captured with beautifully restored original hardwood floors throughout and with 2 bedrooms and 2 bathrooms this cozy pecky cypress bungalow has ample space for 4 people. 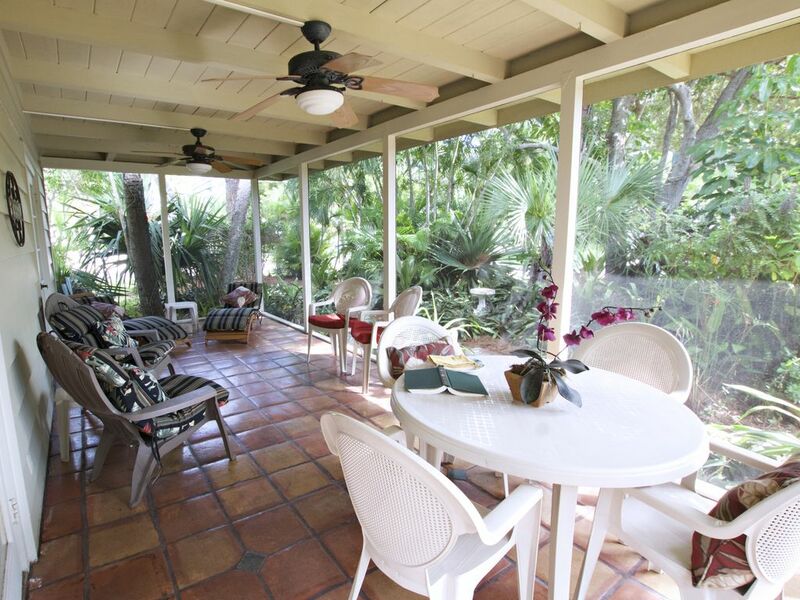 When you’re ready to dine outdoors, why not head out through the French doors into your private lanai where you can enjoy being surrounded by the lush tropical gardens…Your perfect winter getaway awaits. Siesta Key, Sarasota, Florida is on the Gulf of Mexico. Fly into Tampa and drive a little over one hour south on I-75 to exit 205, or fly into Sarasota and taxi or rent a car and in fifteen minutes you're here! And, don't forget beautiful downtown Sarasota and bayfront is just over the bridge. It is just a short drive for a unique cultural experience from the Ringling Museum, multiple theatres, ballet, orchestra, opera, gorgeous Selby Gardens, and endless dining and shopping options. * The Lily Patch has washer and dryer and is completely turn-key. * Definitely NO SMOKING - NO EXCEPTIONS. * Rates are subject to 12% local rental tax. * Minimum Monthly rentals only. * $1000 refundable security deposit required on all rentals. * Utilities and final cleaning will be deducted from security deposit. We are Ali, Rich and Chloe Jane Light. We moved to Siesta Key in 1997 and have never looked back. We absolutely love living here and sharing our paradise with our guests. We have been renting our six cosy bungalows since 1998. Ali is an artist and has drawn inspiration for colors and design of our bungalows from our travels to Hawaii, Ireland, and the British Virgin Islands. Rich was a custom design home builder and landlord for many years in the Philadelphia region, so together we have found the perfect match for having beach rentals. When we moved to Siesta Key in 1997 we knew that we wanted to be able to share this gorgeous area with others and having rentals seemed to be the perfect way. The unique benefit of staying at our properties are the ability to walk right to the beach and village, or we provide bicycles so you can explore the island. We are always available and live just a few doors away from most of our places. We are always excited to share our favorite places and restaurants so even our single guests feel like they have family here. Both bathrooms have a vanity for storage. There is an outside shower also for showering off in the sun, especially great after a day at the beach. DOWNTOWN SARASOTA IS JUST OVER THE BRIDGE with lots to due from Art Galleries, Opera, Dinner Theatre & More! We are a 5min walk to famous SIESTA BEACH. SIESTA VILLAGE is a 5 min bike ride were there is everything you need from our market to restaurants! Fully equipped kitchen with everything you'd need. There are two dining tables, one inside and one outside on the lanai each has seating for four people. Large Flatscreen TV. Has Blue Ray DVD attached to acess Netflix and other apps. Blue Ray DVD with Internet connection. We have a rotating library of books available. We have also invested in a little library box in our neighborhood for exchanging books with. The Lily Patch has lush tropical gardens surrounding the house. The Lily Patch has a large lanai. Most guests spend most of their time on the lanai. It is surrounded by landscape so it is very private, yet allows you to watch the neighbors walking their dogs. New tennis courts at Siesta beach just five minutes away. There are many golf courses within a twenty minute drive.